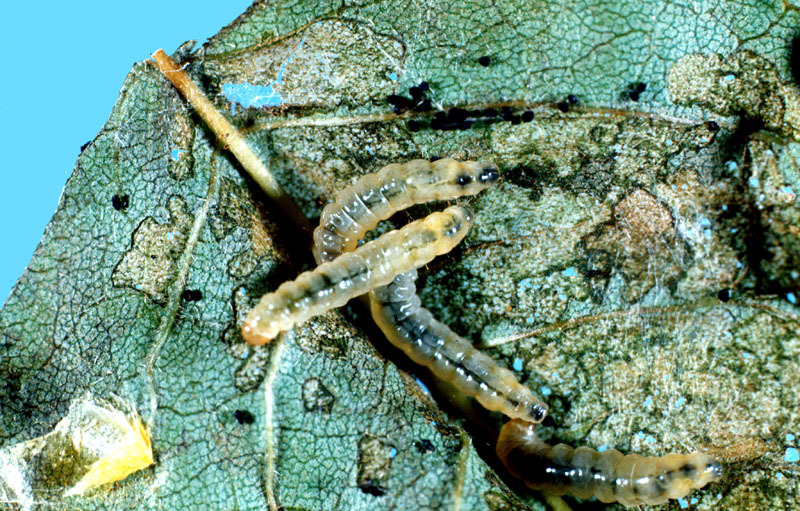 The lilac leafminer is of European origin but is now widely distributed in eastern Canada. The larvae mine and roll the leaves, and often cause complete browning of the foliage of lilac and privet shrubs or hedges. The brown, wrinkled leaves commonly observed on these plants in midsummer can also result from weather injury or various other blights, but are usually due to the lilac leafminer. The adult is a brown moth about 6 mm long. It appears around the later part of May or early June, flying and laying its eggs during the evening. The eggs are deposited in groups of 5 to 10 in the axils of the veins on the undersides of the leaves. They hatch in 7 to 10 days and the small green larvae burrow into the leaves and begin to mine between the leaf surfaces. At first the feeding shows up as small discoloured spots, but later the mines become larger and appear like large blotches. The larvae are pale yellow and about 6 mm long; several may be found feeding on the same leaf. After about three weeks, they come out on the surface, roll up the leaves, and feed inside the roll. About 10 days later, they drop to the ground and pupate in the debris just beneath the surface. About two weeks later (early August), a second generation of moths appears and the life cycle is repeated. Feeding by the second generation continues until about mid-September. The mature larvae go into the ground and spend the winter in the pupal stage. The larvae of this species are difficult to kill because they feed between the upper and lower surfaces of the leaves where they are protected from ordinary contact and stomach insecticides. A registered systemic insecticide (those that are absorbed into the plant making it poisonous to insects when eaten) is effective. Leafroller: Hides and feeds inside a leaf or the tip of a leaf that it has rolled up into a cigar-shaped tube.